Macaroons 005, originally uploaded by CharmChang. When working out front at Ganache, I also have some assembly and packaging responsibilities. It is all very mindless work and it gives me time to reflect on how different my life is now compared to before when I was in medicine. In the past, I always craved time when my brain did not need to be active and thinking. This actually did happen occasionally during ophthalmology (for example, when seeing the 10th patient of the day with blepharitis and dry eyes). Nowadays, there are times when I have a surplus of mindless time and I am unsure of how I feel about it. Yesterday, I took over 700 macaroons and paired them up (by size) so that today, I could sandwich them together with filling. 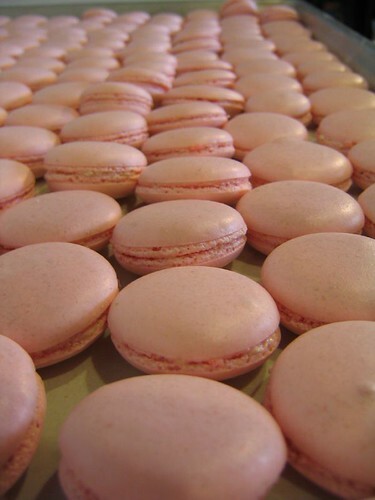 Ganache makes four flavours of macaroons (strawberry, lemon, coffee, and chocolate) and they are sandwiched together with flavoured buttercream (or lemon curd for the lemon macaroons). The work is repetitive and not difficult. My days out front are typically mindless, interrupted occasionally by bursts of activity. Although I have absolutely no regrets about my decision to leave ophthalmology, I do find the contrast of my old versus new life quite astounding at times. Posted by Charmaine at 9:28 p.m.
As long as you are happy the activity doesn't matter. You are incredible at anything you do! How have you not gained any weight!?!?!? Let me know if you ever need a person to sample! February 4, 2007 at 7:39 p.m. Thank you Sylvia. You certainly understand what I mean about blepharitis and dry eye! Come to Vancouver and be my sampler! February 4, 2007 at 8:34 p.m.
February 7, 2007 at 2:44 p.m. Thanks my Erik with a K. I don't think I can survive another career change as yet! Let me know when you're back in Vancouver. February 7, 2007 at 6:55 p.m.